I just thought of another story. You guys in Singapore think of many things. One of my cleaners Ah L. when I first arrived in Singapore, she likes to grow these bulbs during Chinese New year. It is supposedly: It will grow very well if your luck is good, and vice versa. Every year she grows these bulbs in water, the bulds don't grow. Me, a Christian originally from sarawak have never heard this. I ask her, why you bother to grow when you know it won't grow. My friend K. always is successful. My cleaner Ah L. says," of course, you people are professor's wives, I am just a cleaner." I don't grow them either, in case my bulbs don't grow. I must ask my friends what they are called. For me, gardening is my hobby, and I believe if a person really take care of those plants (they will learn to take care even they don’t know), those plants sure will return you with beautiful leaves, flowers or fruits. The feeling is happy, and when a person is happy, I believe good luck sure will follow. Happy gardening, love the nature love our earth. 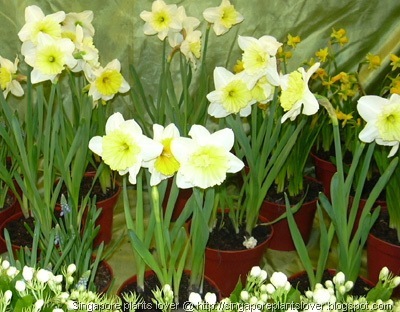 The name Narcissus always reminds of the vain character in Greek myth. But it IS a beautiful flower.